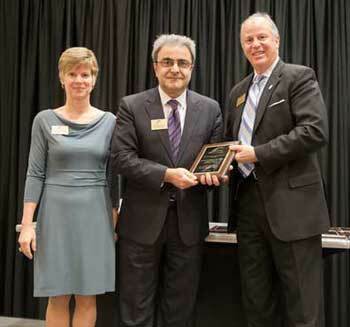 The GW Virginia Science & Technology Campus (VSTC) was nominated for the new Community Leadership Awards (large organization category), presented by the Loudoun County Chamber of Commerce at their annual meeting on Jan. 31, 2013. The new awards continue in the Chamber’s tradition of recognizing excellence by honoring those individuals and organizations that have demonstrated the highest level of commitment, generosity and leadership to support the needs of the Loudoun County community and its citizens. Winners were selected from sixteen finalists in four categories. For the VSTC, academics and research blend with community interaction to enhance the quality of life in our region and beyond. Campus based community activities include outreach to teachers, students and families of Loudoun County Public Schools through such partnerships as: Science, Technology and Engineering Day, Go Girls Camp, and the GW Teachers in Industry Project. The VSTC hosts public art exhibits of local students, teachers, and professional artists and the leadership lends its time and expertise to numerous regional boards and commissions. The overall success, health and profitability of the residents and businesses of a region depend heavily on the vitality of its non-profit community. In collaboration with area non-profits and County agencies, the Campus provides access to facilities, staff and faculty for such groups as the Department of Public Health, the Department of Mental Health Substance Abuse and Developmental Services, the Electoral Board, the Goose Creek District Boy Scouts, Leadership Loudoun and the Small Business Development Center. Throughout the year, the VSTC coordinates numerous collections for Loudoun Interfaith Relief, the Community Holiday Coalition, Loudoun County Department of Social Services, and INOVA Bloodmobile, supplying vital resources to a growing community. In connection with the academic health care programs in nursing and health sciences, VSTC students and faculty lead health fairs and education sessions for local schools, Girl Scouts and clients of the Loudoun Free Clinic. Educational partnerships have also been forged with the Loudoun Free Clinic and HealthWorks for Northern Virginia. Since 2008, the VSTC has provided free access to the resources of the Foundation Center including a database of over 92,000 granting organizations as a Foundation Center Cooperating Collection (FCCC) site. More than 500 community members have attended grant writing workshops provided by our library staff and independently used the database to access funding opportunities. GW VSTC was privileged to be a finalist in the large organization category, along with Middleburg Bank, Howard Hughes Medical Institute’s Janelia Farm Research Campus, and Miller & Smith. The award in this category was presented to Middleburg Bank.